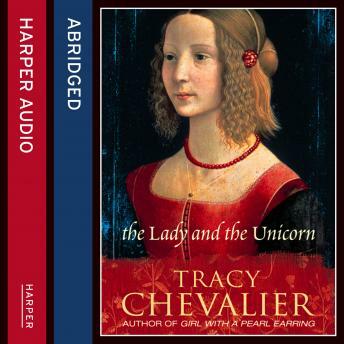 The new novel from the author of the much-loved Girl with a Pearl Earring and Falling Angels. The Lady and the Unicorn tapestries are a set of six medieval tapestries. Beautiful, intricate and expertly made, they are also mysterious in their origin and meaning. Tapestries give an appearance of order and continuity, as if designed and made by one person, belying the complicated process required to create them. Weavers, patrons, designers, artists, merchants and apprentices were involved in their making, and behind them were the wives, daughters and servants who exercised influences over their men. Like the many strands of wool and silk woven together into one cloth, so these people came together in a complex dance to create the whole picture. Jean le Viste, a newly wealthy member of the French court, commissions the tapestries to hang in his chateau. Nicolas, his chosen designer, meets le Viste's wife Genevieve and his daughter Claude, both of whom take a keen interest in the tapestries. From Paris, Nicolas moves to a weaver's workshop in Brussels. The creation of the tapestries brings together people who would not otherwise meet - their lives become entangled, and so do their desires. As they fall in love, are shunned, take revenge, find unrequited love, turn to the church or to pagan ideals, the tapestries become to each an ideal vision of life - yet all discover that they are unable to make this ideal world their own.